You’re still carrying around your precious autoyast config files on an unencrypted usb stick? You have a customized installation disk that could reveal lots of personal details? You use ad blockers, private browser tabs, or even tor but still carry around your install or rescue disk unencrypted for everyone to see? You have your personal files and an openSUSE installation tree on the same partition just because you are lazy and can’t be bothered to tidy things up? A simple Linux install stick is just not geekish enough for you? mksusecd can now (well, once this pull request has been merged) create fully encrypted installation media (both UEFI and legacy BIOS bootable). Everything (but the plain grub) is on a LUKS-encrypted partition. If you’re creating a customized boot image and add sensitive data via --boot or add an add-on repo or autoyast config or some secret driver update – this is all safe now! You can get the latest mksusecd-1.54 already here to try it out! (Or visit software.opensuse.org and look for (at least) version 1.54 under ‘Show other versions’. And then dd the image to your usb stick. But if your Tumbleweed or SLE/Leap 15 install media are a bit old (well, as of now they are) check the ‘Crypto notes’ in mksusecd --help first! – You will need to add two extra options. It’s Hack Week time at SUSE! But before we dive into all kind of crazyinnovative experiments, let’s take a look to what we achieved during the latest development sprint. During recent weeks, the AutoYaST version for the upcoming SLE 15 family has received quite some love regarding the integration with the new storage layer, from fixing bugs to adding some missing (and even some new) features. So let’s have a look at what we have done so far. First of all, a new error reporting mechanism will debut in the upcoming AutoYaST version. 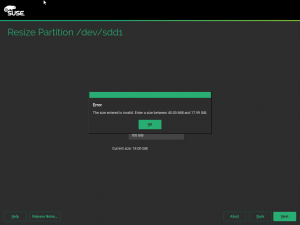 Until now, when a problem occurred during partitioning, you got a message like “Error while configuring partitions. Try again.“. It does not help at all, right? At that point, you were on your own to find out the problem. Now AutoYaST is able to identify and report different problems to the user in a convenient way. What is more, in many situations it is even able to point to the offending section of the AutoYaST profile. The error reporting mechanism can distinguish between two different kind of issues: warnings and errors. When a warning is detected, a message is shown to the user but the installation will not be stopped (it honors the settings in the <reporting> section). Errors, on the other hand, will block the installation entirely. Please, bear in mind that this error reporting mechanism is only available for the <partitioning> section. Maybe it could be extended in the future to cover other parts of the auto-installation process. 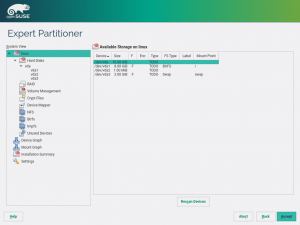 When defining a partitioning schema, you can let AutoYaST decide which device should be used for installation. Thanks to that, you can use the same profile to install machines with, for instance, different storage devices kernel names (like /dev/sda and /dev/vda). Needless to say that, in such a situation, we might want to influence the decision process. For example, we would like to avoid considering USB devices for installation. AutoYaST offers a feature known as skip lists which allow the user to filter out devices using properties like name, driver, size, etc. Unfortunately, skip lists support in SLE 15 Beta1 is rather limited. But these days we have extended yast2-storage-ng to offer additional hardware information and now AutoYaST is able to use it to filter devices. As a side effect, the ayast_probe client has been fixed to show (again) which keys you can use in your skip lists. Apart of adding or bringing back features, we have fixed several bugs. You can check the recent entries in the yast2-storage-ng changes file if you are interested in the details. We know that a few features are still missing and more bugs should be addressed sooner or later, but hopefully AutoYaST must work in most use cases. 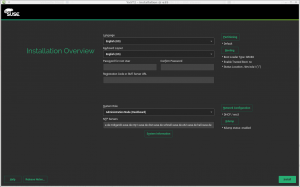 This sprint we also continued implementing the upgrade from SUSE Linux Enterprise (SLE) 12 products to the version 15. Particularly we solved the upgrade of unregistered systems. In that case you need the “SLE15 Installer” medium and additionally also the “SLE 15 Packages” medium. The installer medium contains only the minimal packages for installing just a very minimal system. The rest is available either via the registration server or via the extra medium. Obviously for unregistered systems only the second option makes sense. In this sprint we were focused on making all pieces to work together. You can see the result in the following screencast. 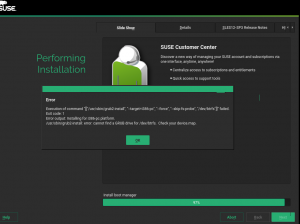 We got a bug report that the beta version of the upcoming SUSE Linux Enterprise Server 15 was sometimes crashing during installation on a system with 512MB RAM. That’s bad, the 512MB is a required limit which should be enough to install a minimal system in text mode. At first we thought that the crash was caused by insufficient memory, but the reported memory usage was OK, there was still enough free memory. It turned out that the problem was in the pkg-bindings which tried to evaluate undefined callback function. The fix was quite simple, however, the question was why that happened only in systems with 512MB RAM and not when there was more memory. Later we found out that the difference was caused by the extra inst-sys cleanup (mentioned in the Sprint 22 report) which YaST runs when there is low memory. In that case YaST removed the libzypp raw repository metadata cache. The assumption was that when the data is already parsed and cached in the binary solv cache the original files are not needed anymore. However, libzypp still might use some raw files later. So we changed the inst-sys cleanup algorithm to remove only the files which we know are not needed later and keep the rest untouched. Several features have been brought back to the expert partitioner during this sprint. Allow to create and delete logical volumes. Allow to delete MD RAIDs. Allow to work with multipath devices. Now you can create logical volumes using the expert partitioner. 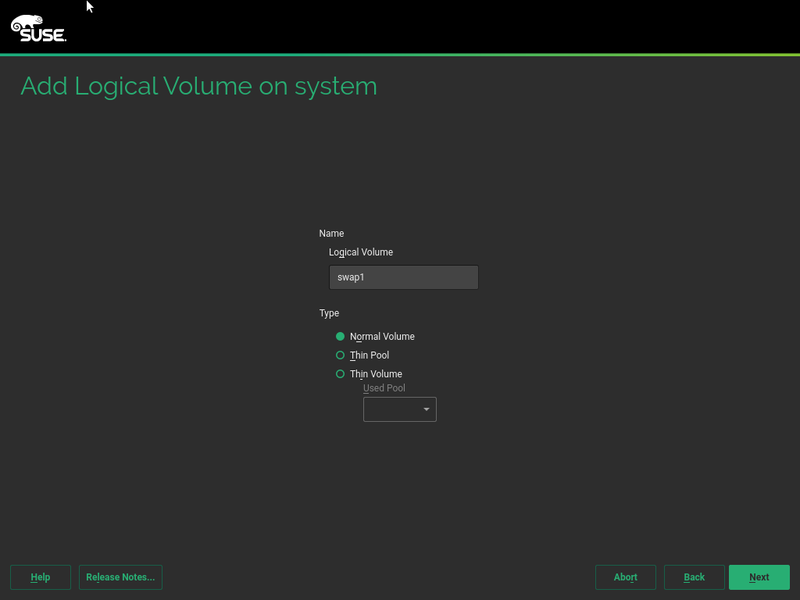 When you go to the LVM overview or visit a specific volume group, a button for adding a logical volume is available. Clicking on it, you will be taken through a wizard for the creation of a logical volume. 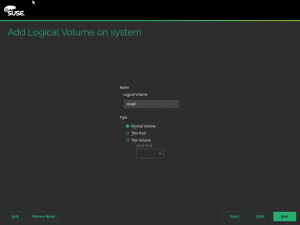 Note that although the logical volume type can be selected in the first wizard step, only normal volumes can be created. Thin logical volumes and thin pools will come soon. And apart of creating logical volumes, now there is also a button for deleting them. Delete action has been also implemented for MD RAIDs. 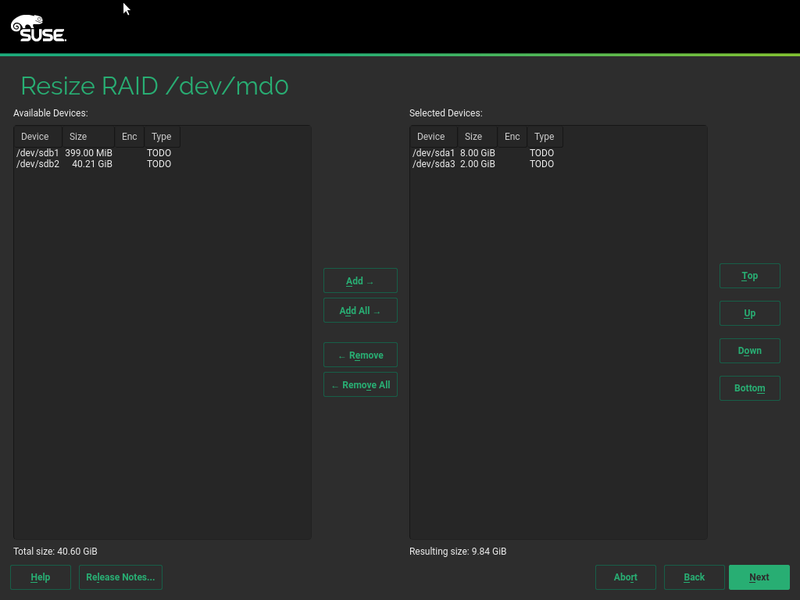 For that reason, you have a delete button in the RAID overview and also when you access to a specific MD RAID. And of course, you will be asked for confirmation before removing the device. Additionally, another important feature recovered during this sprint is the possibility to work with multipath devices. 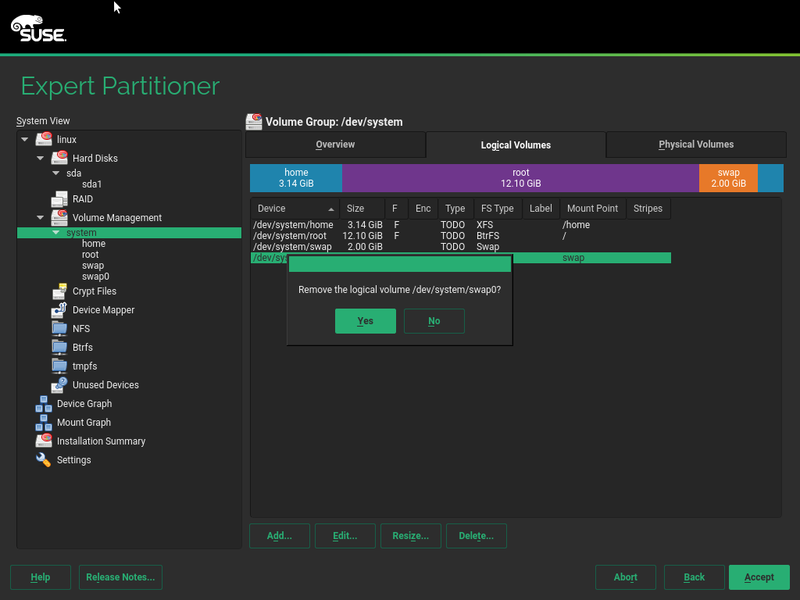 Now, multipaths are listed together with other disks in the tree view of the expert partitioner, allowing you to manage them as regular disks. For example, you can create or remove partitions over them. Moreover, when a multipath device is selected, a new tab is showed to list the so-called “wires” that belong to the multipath. 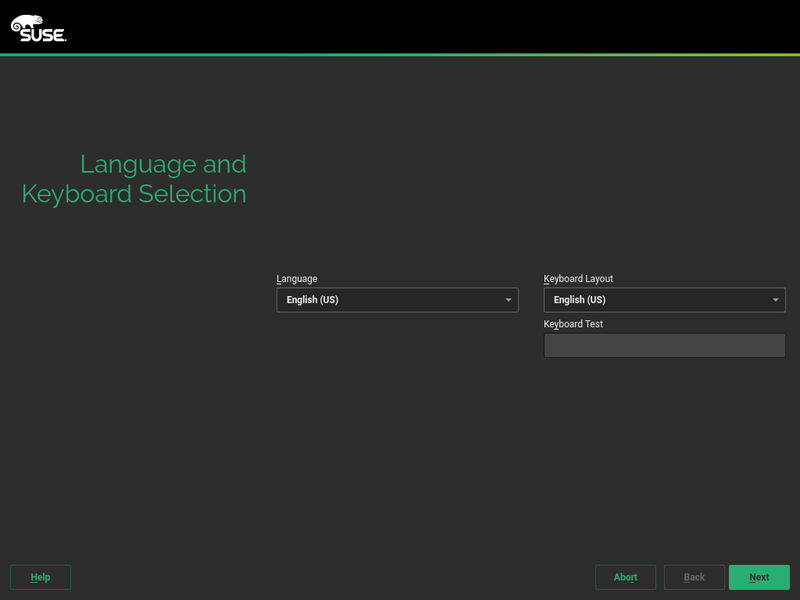 Although the possibility to offer an upgrade option from openSUSE Leap to SLE is on both SUSE and openSUSE radars for the future, the reality is that it has been, and still is, an unsupported scenario. 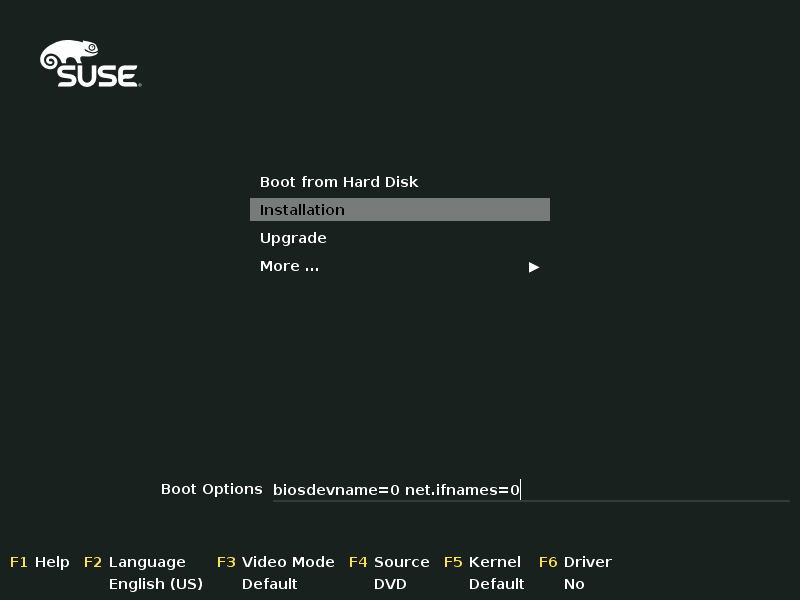 But with previous versions of SUSE Linux Enterprise, you could take a SLES DVD, boot it in the Upgrade mode, and select to upgrade an openSUSE partition. 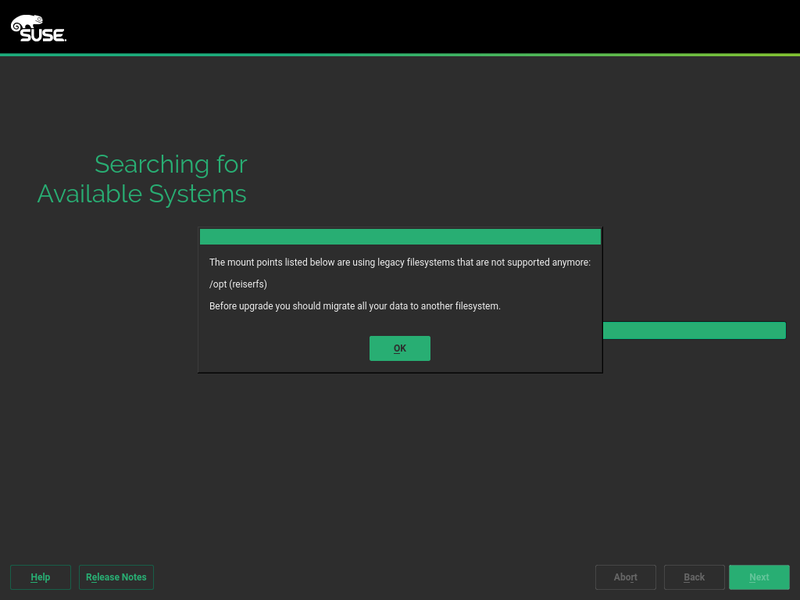 YaST would let you proceed several screens before telling you that it actually will not let you upgrade from openSUSE to SLES. 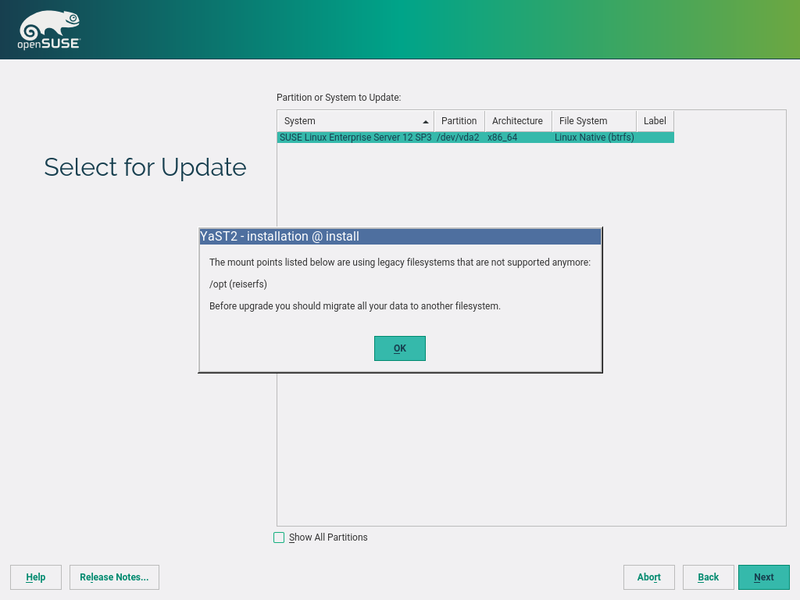 Starting with recent SLE15 pre-releases, the incompatible products are filtered out in the partition selector already (overridable with a Show All Partitions checkbox), letting you know earlier whether you will be able to upgrade your system to the new SLES. 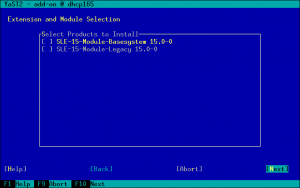 In SLE 15 Installer, there is a product selection dialog at the very beginning of the installation. After that, you can register the selected product but you cannot change the product later as unregistering the product and registering another one is not supported. Our awesome QA squad found out that when the installation was aborted and then started again from Linuxrc without rebooting, the installer thought that the product had been already selected and did not offer any product for installation. A little fix made it work again – now we always execute the following SUSEConnect command at the start of the installer. That removes all traces of previous registration attempts from the Installer. 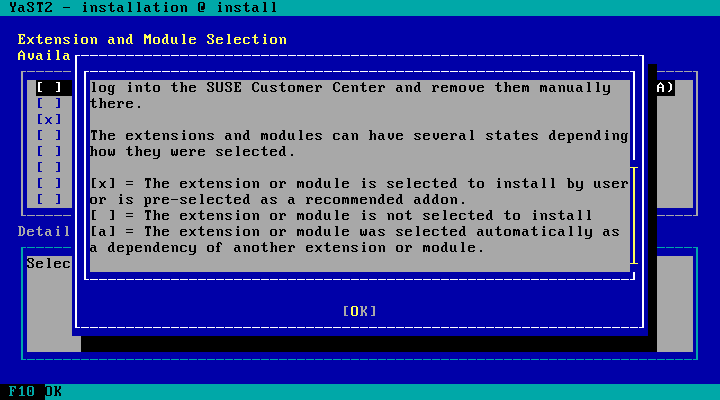 This also means that you might still want to unregister directly at SUSE Customer Center if needed. As you have seen so far, we have been working hard to polish the registration experience in many aspects and scenarios. That also includes a better communication with the user. Thus, the help text in the registration module has been improved to also include the description of the check box states. This is especially important for the “auto selected” state which is specific to this dialog and is not used anywhere else. The help texts in YaST use an HTML subset which allows also including images. In this case we included the check box images directly from the UI stylesheet. But in the text mode we have to use text replacement instead of the images. That means the help text content must be created dynamically depending on the current UI. Here you can see examples of both interfaces. In our report of sprint 42 (to be precise, in the section titled “Twisting the storage proposal”) we presented our plans to make the software proposal more customizable in a per-product basis and the draft document of the new format for control.xml that would allow release managers to define the installer behavior in that regard. Now this goes further than a mere specification and the new format is actually being used to define the partitioning proposal of both the KVM/Xen role of SUSE Linux Enterprise 15 and the upcoming SLE15-based CaaSP. 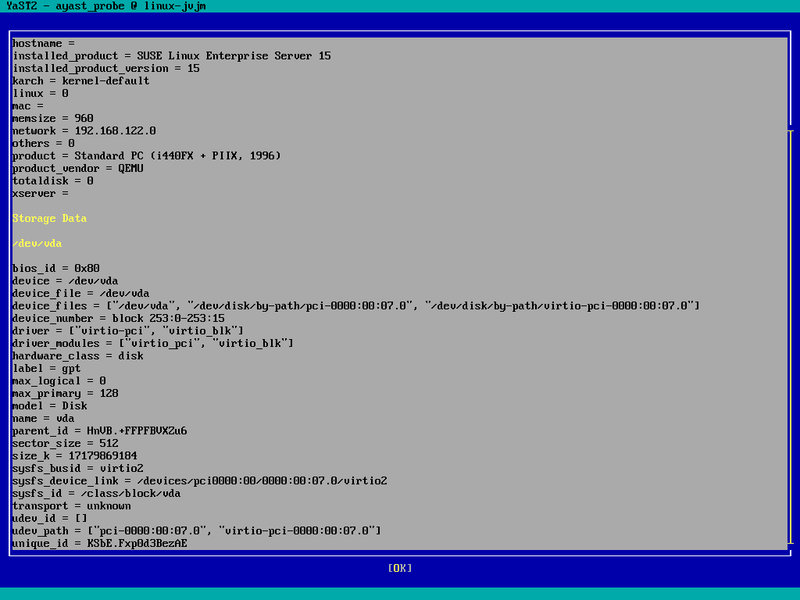 In the following screenshot you can see the corresponding step of the guided setup for the mentioned KVM/Xen role, in which the classical controls for the /home and Swap partitions have been replaced by more goal-specific volumes defined in the section of the control file describing the role. And, as you can see below, the installer now honors those settings to propose a reasonable partition layout. 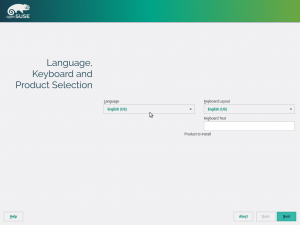 The new format and the corresponding implementation of both the logic and the UI are flexible enough to empower the release managers to define all kind of products and to make possible for everybody to create a more customized derivative of openSUSE without renouncing to the power of the automatic proposal. See another example below (not corresponding to any product or derivative planned in the short term) with more possibilities and note how the wording was automatically adapted to talk about LVM volumes instead of partitions, based on the user choice in a previous step. Chrony will replace the classical ntpd as default NTP client starting with SLE15 and openSUSE Leap 15. That will offer several advantages to system administrators and other users, as can be seen in this comparison. In order to make this replacement possible, we started a research to find out what is supported in Chrony and how to allow our users to configure it through YaST. The research phase is now complete and we have already a plan to proceed with the adaptation of the existing yast2-ntp-client module. Also a few bits of code, which allows to set the NTP service during installation, are now in a feature branch (so not yet in Tumbleweed). The next step will be a huge improvement (and simplification) of the YaST module, which will go further than adapting a list of options. In the screenshot below you can see the not yet finished prototype in action. Originally the keyboard configuration was written directly by YaST in the corresponding Systemd-related configuration files. But we got a bug report that YaST should not touch the config directly and rather call the localectl tool for changing it. (See the details in the localectl man page). However, this works only in the installed system, it does not work in the system installation as it needs a running Systemd that is not available during the installation process. Changing the setting for a not running system must be done using the systemd-firstboot command. But this did not supported modifying the keyboard settings. Fortunately one of the SUSE developer helped us and implemented this feature to Systemd (pull request). Currently the feature is available in (open)SUSE packages but later it will be available in the upstream release for others. 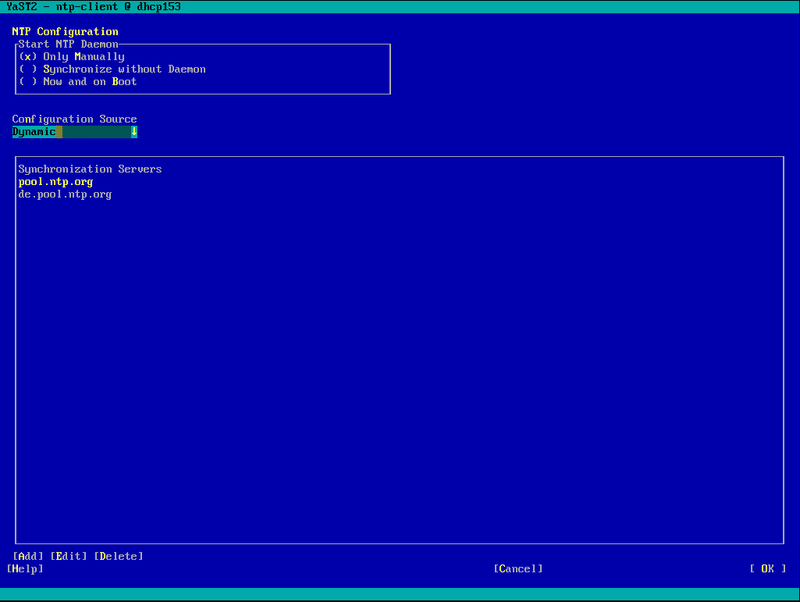 Another related change was that YaST not only set the console keyboard but also constructed the keyboard settings for X11 (GUI). But this is actually a duplicated functionality, localectl itself includes this feature. 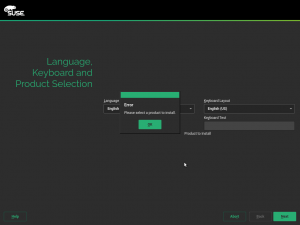 So we have removed it from YaST and let the localectl tool to set both keyboard setting automatically. Hack Week 0x10 (that is, the 16th edition) is starting just right now. Which means most developers of the YaST team will spend a week working on topics that may or may not have a direct and visible impact in our beloved users in the short term. But hey, maybe we will build a robot or a space rocket! After that week, we will restart our Scrum activity. So if nothing goes wrong, you will have another update about the YaST development in approximately four weeks. Meanwhile, join us at Hack Week and let’s have a lot of fun together! The wait is over: finally a new YaST team report, with news about our 45th sprint! Our team is still focused on the development of the upcoming SUSE Linux Enterprise (SLE) 15 products family and openSUSE Leap 15, which in this sprint resulted in new dialogs to select modules and extensions, changes for the multi-product medium, and fixes for issues that have been found during our development phase. So let’s check out the most interesting things that came out of our last sprint. Until now, the self-update URL depends on the product which is ship in the medium. 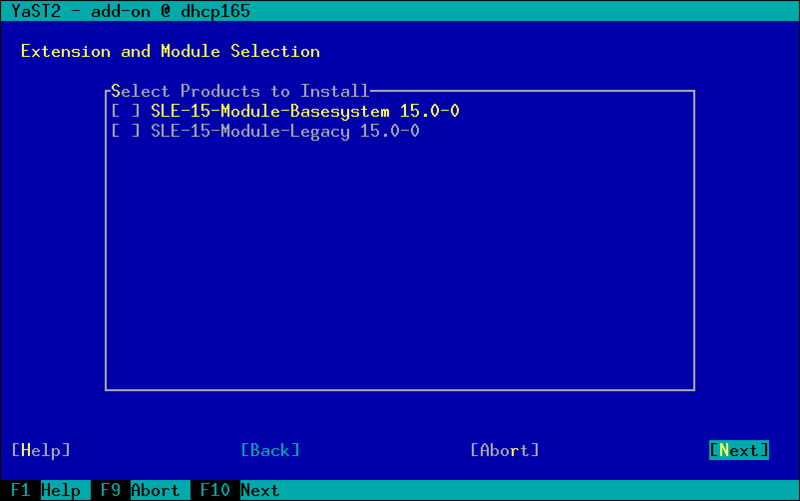 However, as you may know, SLE 15 product family will be shipped in a multi-product installation medium. For that reason, sometimes self-update was failing as only a single product is defined in SCC. Now we have fixed this issue by a defining self-update identifier that is used instead of a product name, which allows the self-update feature to work in a reliable way. 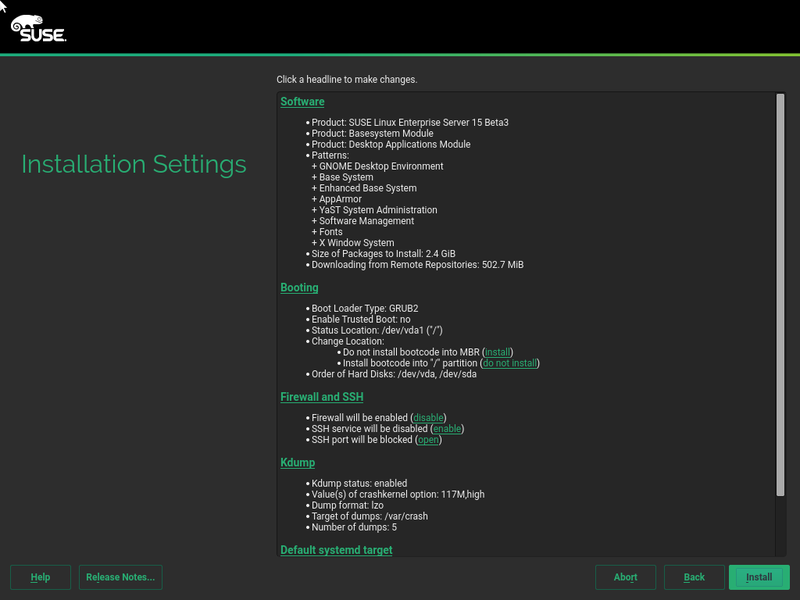 Some sprints ago we announced the addition of product selection to the initial screen for LeanOS installer. The welcome dialog is shared between different workflows like between installation and upgrading. The problem is that for upgrading we need to find the target system or root partition before selecting the product to migrate. Now it does not require any selection if there are no products to select, so it will work when upgrading. Besides that, we have polished some presentation details like the dialog title and the product selector caption. AutoYaST needs to make sure that, after rebooting into the 2nd stage (when needed), the user can access to the installation process using the same tools that he/she used during the 1st installation stage. Apart AutoYaST packages it self, it may need to install other additional tools like VNC, SSH or the X.org system. 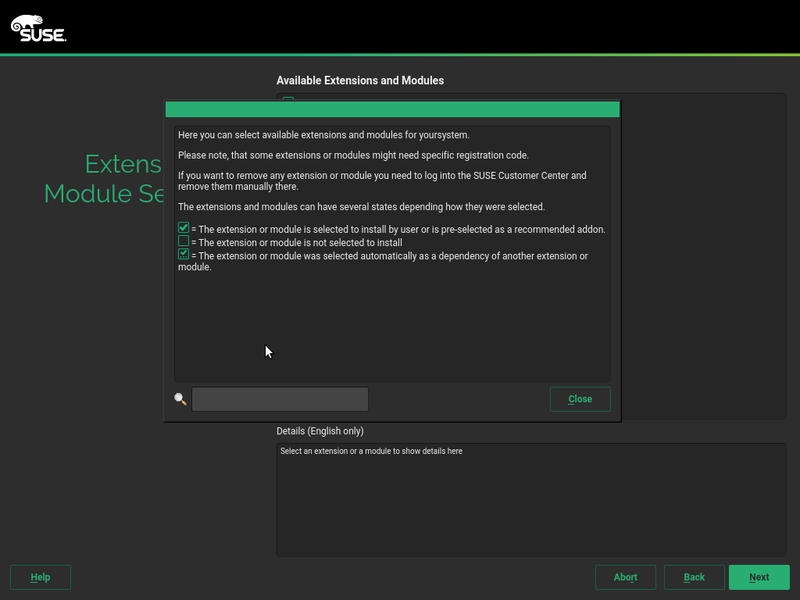 Unfortunately, as SLE 15 is split into modules, it’s not guaranteed that the VNC, SSH or X.org packages can be installed, which resulted in AutoYaST failing when trying to install those packages. We have improved the package handling and now YaST displays a warning that the packages are missing and the system (and later the installer) could not be accessed as expected. However, the AutoYaST installation can still proceed although you cannot watch AutoYaST running during 2nd stage. We got some bug reports about the new multi-repository media handling in YaST (mentioned in the sprint 43 report). Some of the problems were delegated to the underlying libzypp library, but we got our share of real YaST issues. One of those problems was, for instance, the inconsistent styling of the MultiSelectionBox widget used in that dialog, which was pretty confusing. Fortunately, the issue has been fixed and now it looks the same than any standard checkbox widget. The 46th sprint has already started and has many new items planned to be developed, especially for the SLE15 and openSUSE Leap 15 installer. We are looking forward to bring these planned features to life and tell you about all the details of this sprint. Meanwhile, have fun and stay tuned! Here is the YaST team again with a new report from the trenches, this time with a small delay over the usual two weeks. 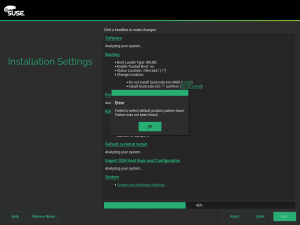 Most of the team keeps focused on the development of the upcoming SUSE Linux Enterprise 15 products family, including openSUSE Leap 15. That means finishing and polishing the new storage stack, implementing the new rich ecosystem of products, modules, extensions and roles (one of the biggest highlights of the SLE15 family) and much more. So let’s dive into the most interesting bits coming out of the sprint. And let’s start with one of those stories that illustrate the complexity hidden below the user-oriented YaST surface. During installation is very common to assign a hostname to the machine being installed to identify it clearly and unequivocally in the future. Usually it is a fixed hostname (stored in /etc/hostname) but in some circumstances is preferable to set it dynamically by DHCP. Since some time ago (as you read in a previous report and is shown in the image below) YaST allows to set the hostname selecting a concrete interface or with a system-wide variable named DHCLIENT_SET_HOSTNAME which is defined in /etc/sysconfig/network/dhcp. The value to be set for such variable during installation can be optionally read from the distribution control file. Last but not least, as you already know, Linuxrc can also be used to enforce a particular network configuration. Most users have a simple setup that works flawlessly, but we recently got a bug report about a wrong network configuration after installing the system if the hostname configuration was set via Linuxrc. After some research we found that the value of DHCLIENT_SET_HOSTNAME coming from the control file was overwriting the Linuxrc configuration at the end of the installation. Now it’s fixed and the global variable will be set by the linuxrc sethostname option if provided or loaded from the control file if not. And all that happens now at the very beginning of the installation to give the user to chance to modify it and to ensure the user’s choice is respected at the end. Take into account that with multiple DHCP interfaces the resulting value for DHCLIENT_SET_HOSTNAME is not fully predictable. Hence, in that scenario we recommend to explicitly select the interface which is expected/allowed to modify the hostname. As we have mentioned (a couple of times) during latest reports, we are implementing multi-product support for the installer. 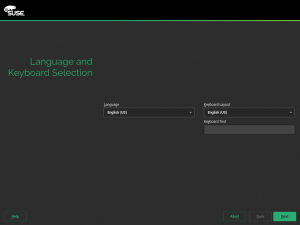 It means that SUSE will ship several products on a single installation media. 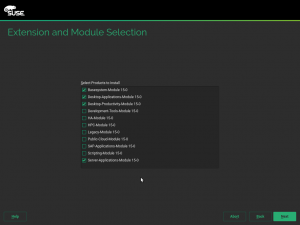 One interesting feature is that products, modules and extensions can define its own installation roles. For instance, if you select the desktop extension, you will be able to select GNOME as system role. During this sprint, we have improved roles definitions handling, displaying a different list of roles depending on which product was selected. As a side effect, we added support for sorting roles assigning them a display order. 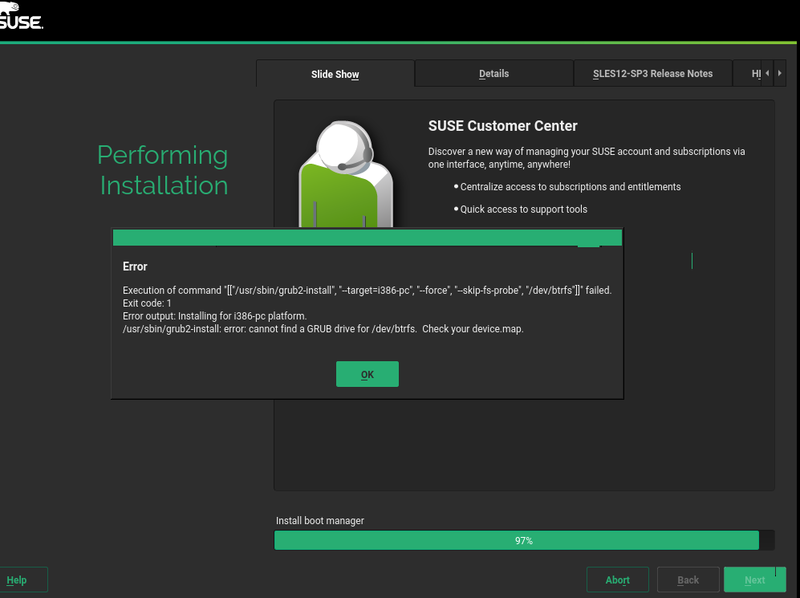 As part of our effort to drop SUSE tags from the installation media, we improved the way in which release notes are handled during installation. 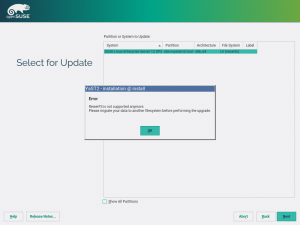 Release notes are downloaded from openSUSE or SUSE websites in order to show always the latest version. Of course, the installation media includes a copy of them, which may be outdated, to be used when there is no network connection. From now on, instead using some additional files, this offline copy of release notes will be retrieved from the release-notes package which lives in the packages repository. So we do not need to ship additional files containing release notes in the installation media anymore. Moreover, although the old approach worked just fine in almost all cases, there was an uncovered scenario. Let’s consider a system which have access to an updated packages repository but is not connected to Internet. That could be the case, for instance, if you are using SUSE Subscription Management Tool (SMT). With the new approach, the installer will get release notes from that repository instead of displaying the (potentially outdated) ones included in the installation media. Additionally, we refactored and clean-up a lot of old code, improving also test coverage. We are also working hard to make sure the brand new yast2-storage-ng includes all the features from yast2-storage, in addition to the new ones. 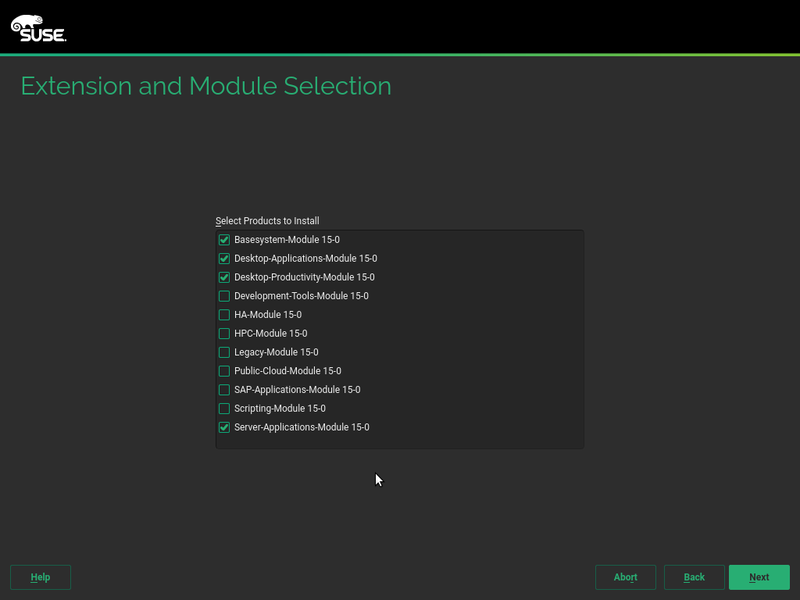 That means that, after this 44th sprint, SLE15 is already able to perform the following operations using the new module. 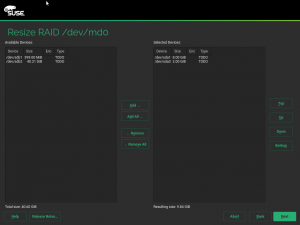 Creating MD software RAID devices in the expert partitioner. This feature is specially relevant for many openQA tests that rely on it. 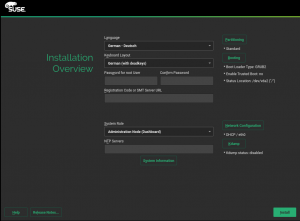 Importing users and SSH system keys from a previous (open)SUSE installation. When trying to create a thin-pool using all free space the metadata has to be accounted for. In contrast to linear LVs the metadata for thin-pool uses space of the VG. For instance, if there are 2048 GiB free in the VG, the metadata for a maximal size thin-pool is about 128 MiB and the pool can be about 2047.9 GiB big. Additionally LVM creates a spare metadata with the same size. This spare metadata is shared between all pools and thus has the size of the biggest pool metadata. The spare metadata can be deleted manually and all pool metadata can also be resized. When starting with an empty VG it is relative easy to account for the metadata. But how to handle this with an already existing volume group? Also take into account a volume group containing e.g. RAID LVs or cache pools (which also have metadata). The only drawback is that the maximal size for the pool can be smaller than actually possible since e.g. the spare metadata might be shared with an already existing thin pool. The 45th sprint has already started and you can expect more and more work in the installer for SLE15 and openSUSE Leap 15 and more news regarding the revamped storage stack. Meanwhile, don’t forget to have a lot of fun! Well it’s been many many years and many many releases that we’ve been carrying a large number of patches for the cloud-init package in openSUSE and SUSE Linux Enterprise. I remember the first semi serious implementation of SLES support happened when I worked with HP to get SLES into the HP Public Cloud offering, which was based on OpenStack. The offer was eventually named Helion Public Cloud and then eventually shut down. Yes, it’s been many many years and I have received many questions about when is SUSE support going to be upstreamed, and my answer was always, “when I get around to it“. Well, it finally happened, in big part thanks to the cloud-init summit which was held for the first time earlier this year. Google in Seattle was a great host and I very much appreciate that I was invited. Anyway, long story short spending some face time with other contributors and working out the kinks that existed in the pipeline worked wonders. Rather than sending a small patch here and there the main implementation for openSUSE and SLE, lots of code, were accepted shortly after the cloud-init summit and over the last couple of days another couple of patches took us another step forward. There are a few more loose ends that need work but with 17 patches removed from the package build, currently building in Cloud:Tools:Next in OBS we’ve made major progress. Well, I for one am happy about this, and those that want to install from source can do so and have openSUSE and SLE support working from the upstream sources and not just from the packages included with openSUSE and SLE. Thanks to Canonical for organizing the summit to get everyone together and thanks to Google for hosting the summit. Oh and before I forget, getting the changes accepted was not the only major step forward, openSUSE Leap 42.3 will, in the not too distant future, like in the next couple of days, be integrated into cloud-init testing using containers the lxd project builds, go figure who knew these even existed. The summer is about to end (in Europe) and it is time for another YaST Development Sprint report. 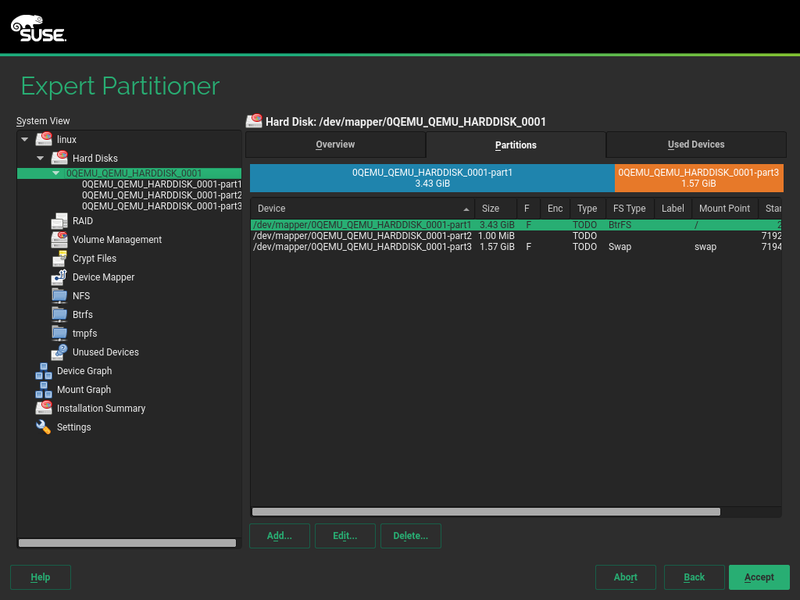 As usual, storage-ng has been one of the stars of the show, but new installer features for upcoming SUSE/openSUSE versions have received a lot of attention too. Also CaaSP 2.0 got some love from us during this sprint. The new storage layer is getting better everyday. After the big amount of work that came with the re-implementation, the team is trying to unleash the power of the new design. 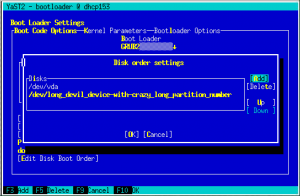 The bootloader module supports using persistent device names provided by Udev. It is a pretty useful feature that comes in handy in many situations but it was missing in the storage-ng based version of the module. But fear not: this feature has been re-implemented taking advantage of the much improved API of the new storage layer. And that’s not all: the team also took this opportunity to clean up some code and document the strategy for picking Udev device names in a proper way. If the device has a filesystem with its mount_by, do not change it. If the device names includes a by-label, just use it. This behaviour enables us to handle the three scenarios. If there is by-uuid, then use it. It can also handle the three scenarios. If there is by-id, use it. It can handle S3, but not always. If there is by-path, just use it. It is the last supported Udev symlink and, at least, it will prevent the name changing during boot. As fallback, just use the kernel name (for instance, /dev/sda3). For quite some time, the storage-ng code has been tested (and worked) on x86_64, ppc64 and s390x architectures. Now, we have added aarch64 to match the list of supported architectures in SUSE Linux Enterprise and openSUSE Leap. It displays only services, not other unit types such as sockets. It can enable/disable them for the next boot. It works, as any YaST module, in textmode (even on 80×25 terminals). Some time ago we got a report that the presented information was inaccurate in some corner cases. We fixed that but also made the module a lot slower at the same time. It did not take long for that to be reported. We tested the following scenario: 286 services (SUSE Linux Enterprise 12 SP3 with nearly all software patterns installed) on a not very fast virtual machine. Normally, you should have fewer services and probably a faster system, but we wanted to fix the issue even for the worst scenario. After analyzing the problem, we found out the root cause: too many calls of systemctl, at least 3 times per service (show, is-active, is-enabled). With a couple dozen milliseconds per call, it quickly adds up. The fix was to combine all show calls into one and correctly interpreting the ActiveState property to eliminate all of the is-active calls. But you want to know the numbers, right? After the fix, the startup time went down from 69 to 15 seconds (bear in mind that it is a slow virtual machine). So even if your system is not that slow or you have fewer services installed, you may benefit of a shorter startup time for this module. There are some hidden gems in YaST that are maybe not well known although they have been there for a long time. One of those features is support for multi repository media. What actually is a multi repository medium? Imagine a CD or DVD with several independent repositories. The advantage is that, if you want to release several add-ons, you can put them all on a single DVD medium. Really nice stuff, isn’t it? Up to now YaST added all repositories found on the medium automatically without any user interaction. In this sprint we have added a new dialog into the workflow which asks the user to select which repositories should be used. Of course, if there is only one repository, it does not make sense to ask and the repository is added automatically. 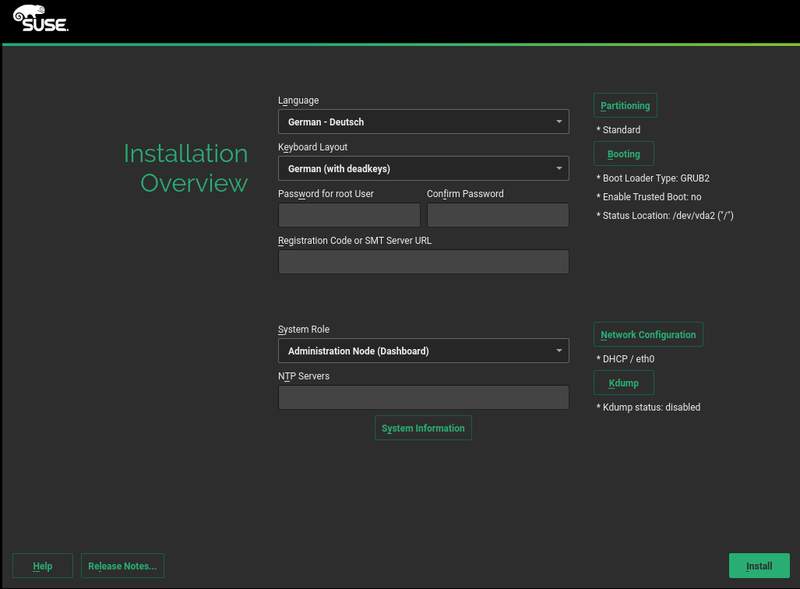 On June 2017, SUSE released the first version of the promising SUSE CaaS (Container as a Service) Platform. 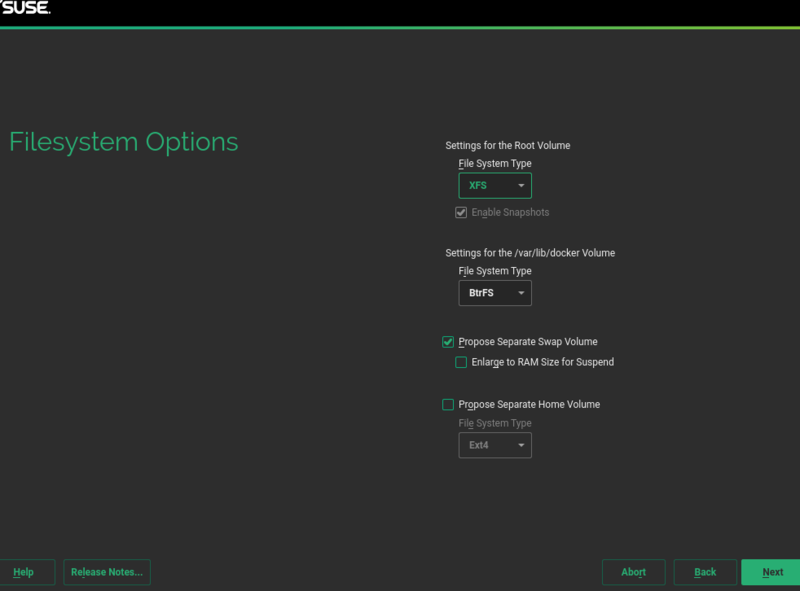 The YaST team actively worked on this project by adding several new features to the installer, like the one-dialog installation screen. installer, as you can see in the screenshot below, and to mark every string in the yast2-caasp for translation. Finally, if you are interested in CaaSP, maybe you would like to check out Kubic, its Tumbleweed based variant. Apart from the new and shiny stuff, the YaST team was able to fix quite some issues during this sprint. Let’s have a look at some of them. Usability is a critical point for a project like YaST. From time to time, we receive a bug report about some usability problem that needs to be addressed and we took them very serious. 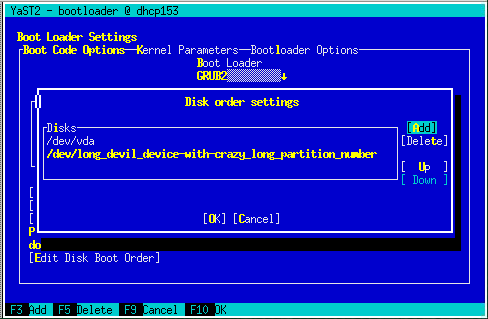 In this case, the bootloader module had a problem when showing long device names in the dialog to change the order of disks. So we just needed to do a minor fix in order to ensure that there is enough space. Please, keep reporting usability related issue you find in order to make YaST even better. It sounds scary, but YaST supports an insecure mode during installation. What does it mean? YaST is pretty flexible when it comes to system installation. You, as a user, has the power to modify/tweak the installer (using a Driver Update Disk), add custom repositories, etc. And sometimes it can be useful to skip some checks. Some time ago, libzypp introduced a new callback to inform about bad (or missing) GPG signatures. This callback was properly handled by AutoYaST but it was ignored in regular installations, so the user always got the warning about the failing signature, even when running on insecure mode. Now the problem has been fixed and you can run the installer in insecure mode if you want to do so. YaST deals with a lot of moving parts and, although it can be daunting for the newcomer, it also has a bright side: we regularly learn new stuff to play with. In this case, Martin Vidner, one of our engineers, had to deal with a fix related to the Fibre Channel over Ethernet support in YaST. But instead of blindly applying the patch that we already had, Martin decided to learn more about the topic sharing his findings in its own blog. Sure it will be a valuable resource to check in the future. Kids started school in Prague, and we’re energized to bring you news from the YaST team. As always, the new storage stack deserves a separate section. Expert partitioner has a better initial summary and it handles Btrfs subvolumes better. Snapper can create and restore snapshots now. A more flexible installation proposal is being developed. It has landed in SLE15/Leap15 already. As we reported three sprints ago, YaST will support having multiple products on the same installation medium. 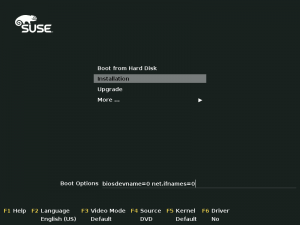 This feature will allow to ship several SUSE products on the same DVD asking the user which one to install. 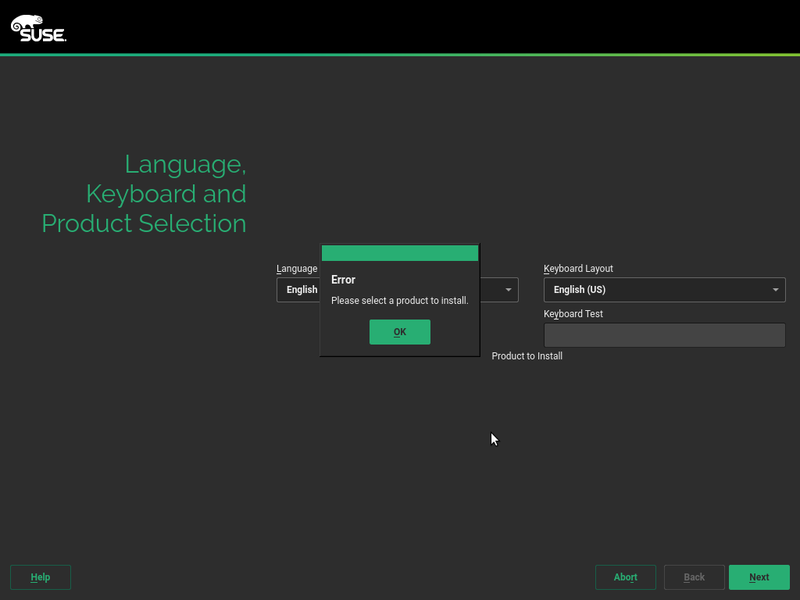 But, as an (open)SUSE user, you may know that the first screen of the installer allows you to select the language/keyboard and, additionally, it shows the product’s license. But which license should we show for multi-product media? After asking our UX expert, we decided to allow the selection of the product in the welcome screen as you can see in the image below. Obviously, this behavior applies only to multi-product medias. When using a single product one, the license is shown directly in the welcome screen. Finally, as developers, we would like to highlight that we mainly re-implemented the welcome screen using modern YaST techniques (like our object-oriented API to YaST widgets), improving test coverage and code quality. In the sprint 40 report, we announced that YaST was dropping support for SUSE tags because the plan is to use RPM metadata and packages to store all that information (licenses, release notes, etc.). During this sprint (and the previous one) we focused on improving how base product licenses are handled. Until now, licenses lived in a tarball which was included in the installation media. But that is not the case anymore: now YaST relies on (the awesome) libzypp to get products licenses directly from the repositories. There are still some rough edges: for instance, multi-language support should be improved, but we will tackle them pretty soon. Finally, bear in mind that only base product licenses have been adapted, but we plan to do basically the same for modules, extensions and add-ons. The YaST installer supports displaying the README.BETA file from the installation medium. This file is added during Beta phase so the users know this is not the final release. This is also useful after the final product is released if you by mistake boot the old medium. Unfortunately the original YaST code supported only the so called SUSE-Tags repository format which was used for the CD/DVD media. 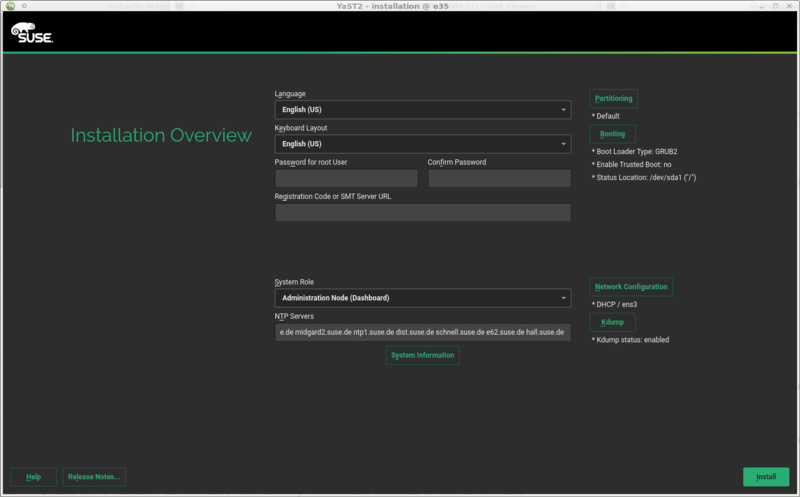 However, the new SUSE Linux Enterprise media will use the RPM-MD format which is something completely different. The drop of ReiserFS support for manual installation was announced in our last post, and now is the turn to autoupgrades. 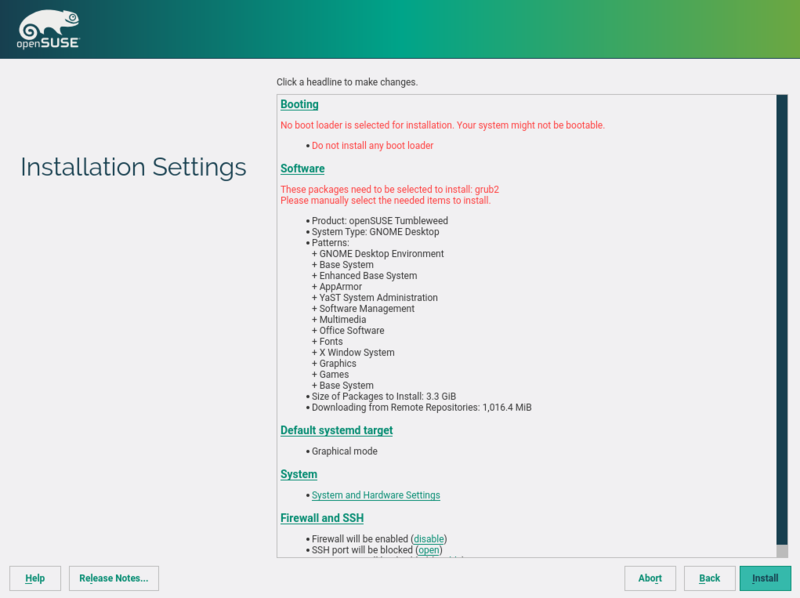 With SUSE Linux Enterprise 15 the autoupgrade will be blocked in case of ReiserFS presence were detected suggesting a manual conversion to another filesystem. 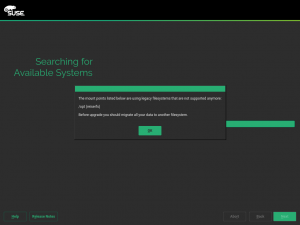 YaST guides you through the installation process of your system making you a proposal based on the different selections like the product, addons, system role, desktop etc. This proposal contains some software patterns that are mandatory and some that are optional but only the mandatory ones will be reported when the proposal is shown. During this sprint we solved a bug which reported not only missing mandatory patterns but also optional ones. As you probably already know, in the YaST team we are rewriting our powerful expert partitioner tool from scratch to adapt it to the new storage layer. Sprint by sprint we are bringing back some of the many great features the expert partitioner offers, and this time it will not be different. Now, when entering to the expert partitioner, all available storage devices are presented in an initial summary. 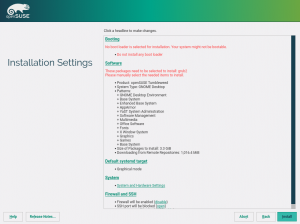 Moreover, in this first screen you could find an option to rescan your devices, which allows the expert partitioner to be aware about the changes in your system, for example when you plug in a USB stick. The management of Btrfs subvolumes was also improved during this sprint. Now, you will be alerted when a new subvolume is shadowed by an existing mount point. Moreover, some subvolumes could be automatically deleted or created when a mount point changes in the system. We reintroduced one of the most important features about using Btrfs: Being able to create snapshots, so you can go back to a previous state of the system if anything went wrong during a package upgrade or when you changed anything about your system configuration. This means we are now again setting up and configuring snapper correctly, installing everything into a subvolume and creating an initial snapshot when the installation is complete. Why install into a subvolume in the first place? When snapshots are made in the future (e.g., during package upgrade or installation) and at some point you decide to roll back to one of those snapshots, you might want to delete previous snapshots to save disk space. If we didn’t install into a subvolume, the initial files would always be left over and consume disk space, so there would be a considerable resource leak. As you should know, one important part of the rewritten storage stack is the partitioning proposal. The old one was designed with a rather narrow scope in mind. Targeting desktops and old-school servers, it always proposes a root file-system, a swap volume and an optional separate /home. That’s not the most useful schema for new innovative products with a different focus like SUSE CaaS Platform, openSUSE Kubic, SUSE Manager, etc. 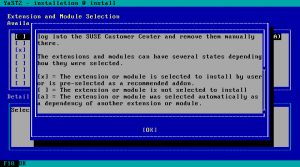 As we remind quite often, all the products supported by YaST (SLES, SLED, Leap, Tumbleweed, Kubic, CaaSP, SUSE Manager, SLES4SAP, you name it) share an identical installer. That installer is fully configurable using the file control.xml that is included in the media and that allows to define the sequence of installer steps, the default values and much more. One of the goals of the new storage proposal is to give product creators and release managers more freedom and flexibility configuring the behavior of the guided setup. And for that we need a better format for control.xml, so they can express themselves with fewer limitations. Of course, that new format is not something for the YaST team do decide on its own, but something being designed openly in collaboration with all the involved parties. To make easier for anyone to jump into the subject we have prepared this detailed document which includes all the present and historical information to understand the topic, as well as an explanation of the new format with several examples based on existing or hypothetical use cases. As everything in YaST, that document is alive and expected to continue changing and evolving based on everybody’s feedback and contributions. So feel free to take a look and suggest improvements or future use cases we may have overlooked. In our previous sprint report we told you we were working to integrate the new storage stack into the future SLE15 and openSUSE Leap 15 codebase. Now the submission process is over and the preliminary images of both future distributions are fully based on libstorage-ng. For openSUSE Tumbleweed, that is the Staging:E project. That means we now have many more eyes looking into it, finding bugs, pointing what is missing and providing feedback about the new behavior. Of course, every couple of eyes comes with a little bit more of pressure for the YaST Team to get things done as soon as possible, but also with a pair of hands to help us getting there. I have not been actively participating in openSUSE project for some time now, as a result there has not been much to blog about on openSUSE Lizards blog, there is a new blog at https://cyberorg.wordpress.com to blog about what I have been and will be up to with Li-f-e: Linux for Education project among other things. I am also now “Member Emeritus” of the openSUSE community due to lack of participation, so cyberorg@opensuse.org email address will no longer work, please use @cyberorg.info if you need to get in touch with me. After almost a decade of bringing you Li-f-e: Linux for Education based on openSUSE, it is now based on Ubuntu MATE LTS releases. I hope to provide the same excellent user experience that you have come to expect. Download it from here. Reason for this change is mentioned in previous post and it’s discussion(lack of interest/time/skills by anyone for maintaining live installer). 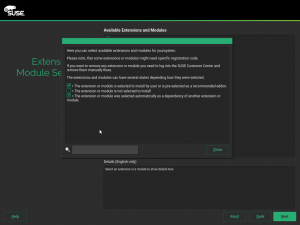 You can of course easily enable Education Build Service repository to install packages on standard openSUSE or use susestudio to create your own spin with Education packages. We all know that everything slows down in summertime and software development is not an exception. But heat is not enough to stop the YaST team from turning the Scrum wheel and delivering the corresponding sprint reports. Let’s take a look to what we have been doing the last two weeks. As already anticipated in the previous report, one of the goals of this sprint was to merge the new storage stack into the codebase of SUSE Linux Enterprise 15 and openSUSE Leap 15. That implies submitting everything to Factory first and making sure the result looks harmless and good enough there. Thanks to the awesome openSUSE tools and processes, that kind of experiments can be isolated in a dedicated staging project allowing us to reach useful conclusions without risking the stability and features of Tumbleweed. So we submitted two new source packages libstorage-ng and yast2-storage-ng to Factory, together with new versions of all the affected packages (already adapted to use the new system, instead of the old yast2-storage) and a modified version of the list of packages to be used during installation. Everything was mixed and cooked in the Staging:E project and… guess what! We got brand new Factory ISOs with storage-ng, successfully building and verified to work by openQA, as you can see in this screenshot of the Staging Dashboard. 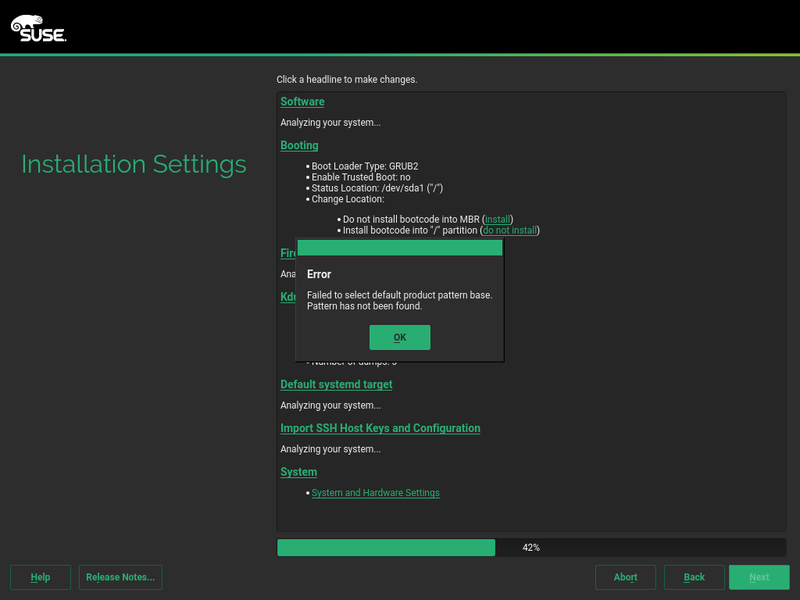 Yes, we know there are two failing tests in that dashboard, but that was fully expected since those tests use the expert partitioner to configure an installation of openSUSE on top of a MD RAID system and the reimplemented partitioner still lacks some controls to configure MD RAID arrays. The new stack will live in Factory:Staging:E (or any other staging project the Tumbleweed crew decides) for quite some time, until it’s feature-pair with the old storage layer and, thus, can progress further in its travel to Tumbleweed. But Factory was just the first stop, the ultimate goal of this sprint was getting into the preliminary versions of the next SLE and openSUSE Leap. That second integration is taking a little bit longer because it has coincided on time with other important changes in the installer and the base system… and the fact that August is the typical European vacation period is not exactly helping to iron all the details out. But since the new storage system works for Factory, we are certain it will do it for SUSE Linux and Leap. As readers familiar with the Tumbleweed development process may have noticed already, having all those packages in Staging:E implies that newer versions of them will only reach Tumbleweed all at once, when yast2-storage-ng is considered mature enough for that. Somehow, that will block us from delivering new features for the packages you see in the list in the mentioned image of the dashboard. But don’t worry, if something serious happens and a critical update is needed we will not let our beloved Tumbleweed users down. But there is much more happening in YaSTland beyond the storage reimplementation. Let’s take a look to the improvements in other areas. Sometimes, users have already Linux installed in their system and they do not want to install Grub in MBR again with a new Linux distribution since the installed Linux can manage the bootloader. 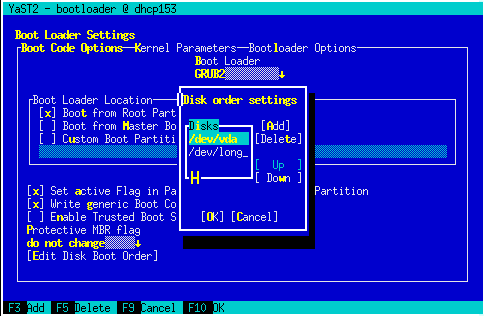 For this case, the user may decide to not install grub packages at all in the system. However, until now the user was obligated to install this package otherwise an error message would appear, as the image below shows. 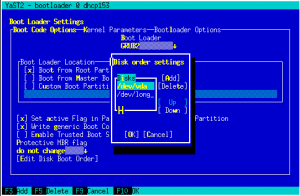 For some specific scenarios, as you may find here, even other packages are required, and when the user decided for not installing the bootloader, these packages were still required for the installation. 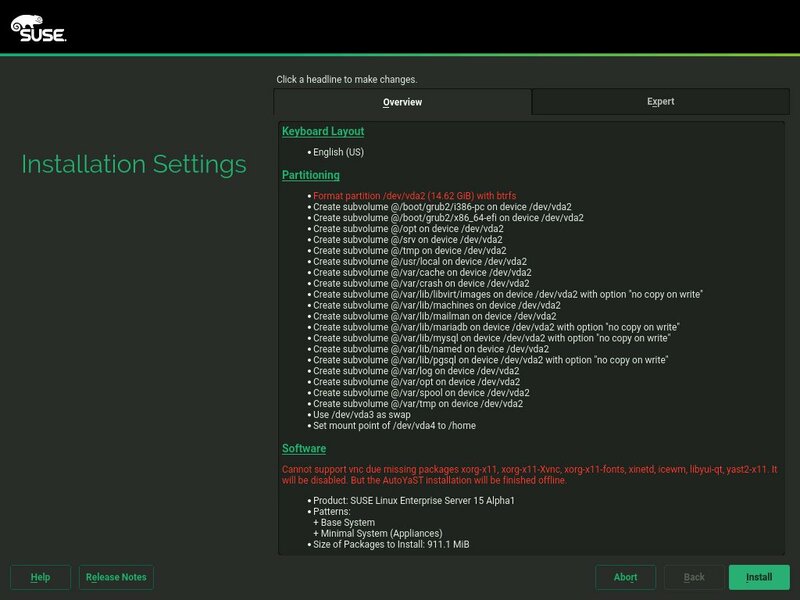 We changed this behavior in Tumbleweed and SLE 15, and now the users will be able to install the system without the packages that are not required, in case they decide to manage bootloader through another operational system. But that’s not the only improvement introduced in the bootloader management during this sprint. In Leap 42.3 and SLE 12.3, we found out that, in some very specific cases (check the bug report for more details), YaST was not finding the correct disk to install Grub in MBR. When it happened, an error message appeared at the end of the installation, showing that Grub could not be installed in /dev/btrfs disk. We improved our approach to finding the correct MBR device, by adding a specific search for the disk where the partition /boot or / (in case /boot does not exist) is located. Such a change will be released as maintenance update and self-update, and it affects only Leap 42.3 and SLE 12.3, since SLE 15 will use the new storage layer, which does not need this double check for the correct disk. 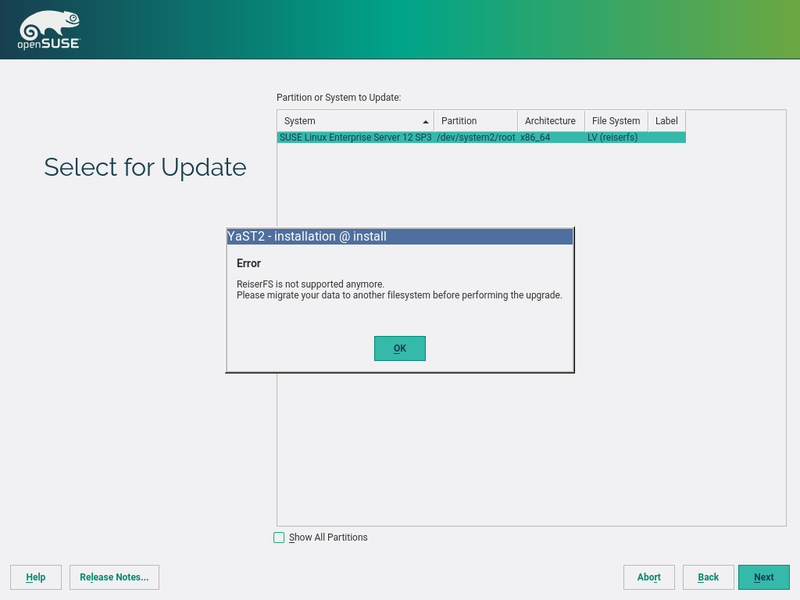 The support of new installations with ReiserFS was removed from YaST in SUSE Linux Enterprise 12 and openSUSE Leap 42 but upgrades were still supported. 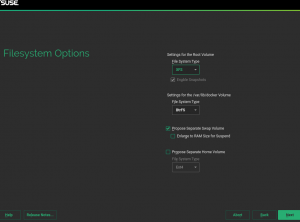 With SUSE Linux Enterprise 15 and Leap 15 the support of ReiserFS will be completely removed from YaST and the installer will block the upgrade of systems formatted with ReiserFS. If some of the entries in the /etc/fstab file of the system to be upgraded is using ReiserFS, the installer will suggest to convert them to another filesystem type before migrating the system to SUSE Linux Enterprise 15 or openSUSE Leap 15. A similar blocking error will be reported for ReiserFS root partitions. This may be interesting for Ruby developers in general. We got a bug report about crashing YaST which in the end turned out to be caused by upgrade to Ruby 2.4. The tricky part was that YaST crashed randomly and it was difficult to reproduce the problem. It turned out that the crash happened when Ruby wanted to print a warning on the error output, which in some situations failed. We did not fix the race condition, as it likely would be too difficult to debug the Ruby internals, but we at least fixed the code to not produce the warnings anymore. So if you are a Ruby developer take this free advise from your YaST fellows – if your code crashes randomly with Ruby 2.4 then check for the Ruby warnings first. Two sprints ago we told you about the new possibility of configuring the network with AutoYaST already in the first stage, avoiding an extra restart of the system in most cases. 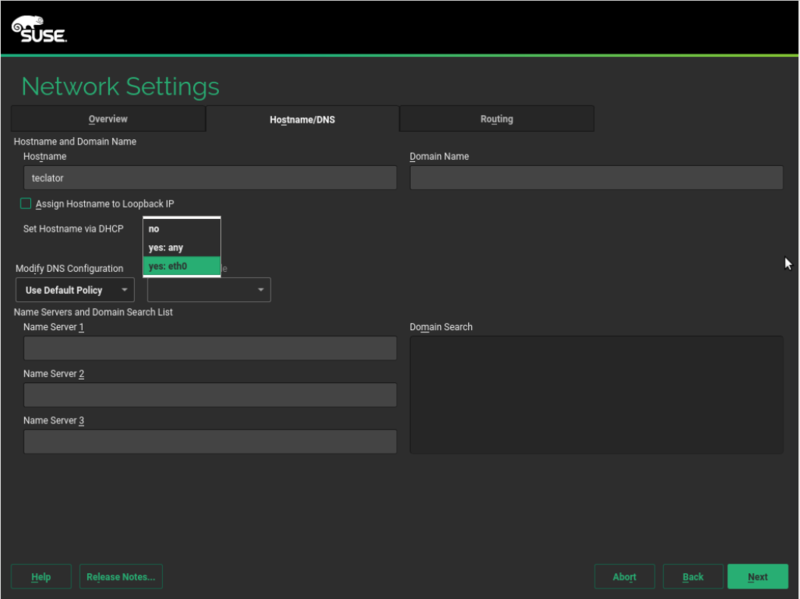 During this sprint we spent some time trying to test old AutoYaST profiles (with complex network configurations) with the upcoming version of SUSE Linux Enterprise Server, using our suite of automatic AutoYaST Integration Tests. But we found some issues caused by the current architecture of our test suite that may be of interest for some of our readers. Let’s see some technical background first. Basically it will assign fixed names based on firmware, topology, and location information making them stable between system reboots, hardware additions or removals and also between kernel or drivers updates. 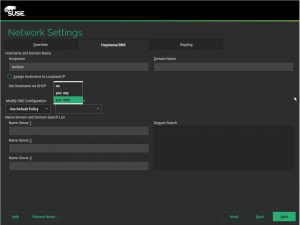 For the upcoming SLE15, we are giving predictable network interface names a try (they are disabled in SLE12 and openSUSE Leap 42.x). For us that turned to be a problem because our AutoYaST testsuite dynamically creates new virtual machines on every system reboot (instead of really rebooting the virtual machine created in the previous step). So from the point of view of the operating system being tested, all the network devices are replaced by new ones in every reboot and that drives the network settings nuts. That was only our case (arguably “our fault”), but there might be other situations in which going back to the old naming scheme (with names like ‘eth0’) would be more convenient than adapting the preexisting AutoYaST profiles to the new one. 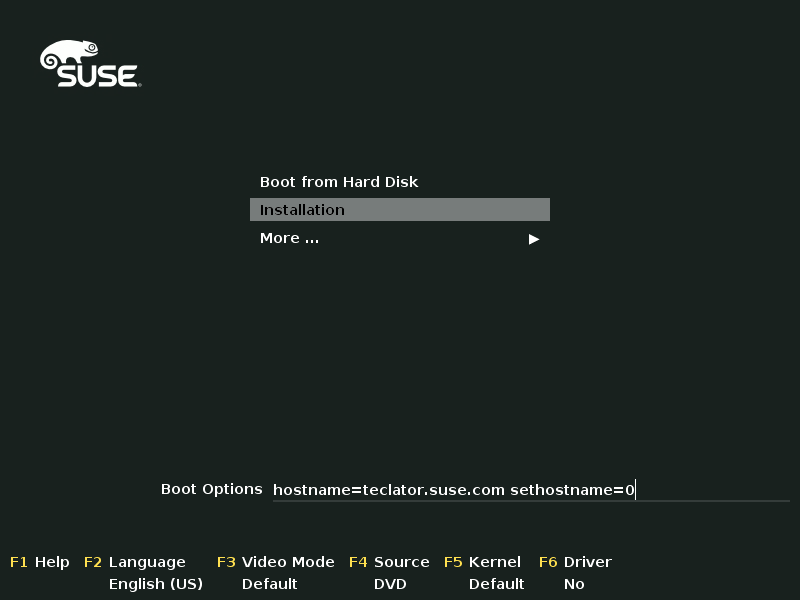 In such cases you still can use the old scheme (not fully predictable but very well known by Linux veterans) by just booting the SLE15 installation with this parameters. In addition to everything reported in this post, we have been working hard to get some new cool features to the upcoming SLE15 and to get the storage reimplementation full-featured enough to substitute the old one in all possible situations. So, although it would still be summertime (in Europe), stay tuned for more news in two weeks.